Cheeses should be pulled out of the refrigerator 30 minutes prior to serving to allow them to warm slightly. Cheeses taste best at room temperature. 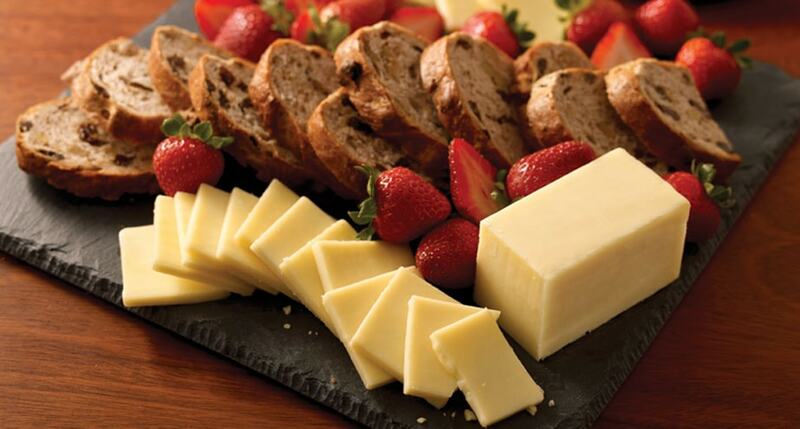 When featuring multiple cheeses on a cheese tray, try to provide a variety in styles, textures and milks. 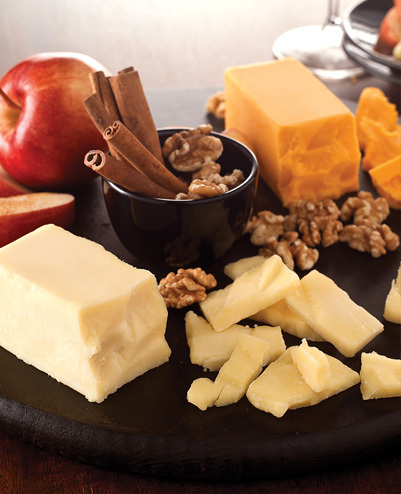 Cheeses from different milks show distinct differences in flavors and aromas. If you plan to slice or cut your cheese before serving, do so as close to serving time as possible. Cheddar is a great anchor for any cheese board. Its popularity and familiar flavor make it a crowd favorite and it provides a great basis for comparison against other cheeses. When tasting multiple cheeses, they should be ordered in terms of flavor. Start with subtle flavored cheeses, like Camembert, on one end of the cheese board and work toward stronger flavored cheeses, like blue cheeses, at the opposite end. 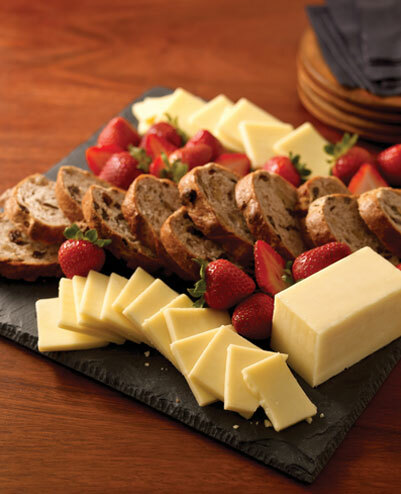 When preparing a cheese tray for company, a selection of at least 3 cheeses is best to provide a good range of flavors. Leave the rinds on cheeses when serving to provide a dash of color to your cheese tray. Separate knives should be used for cutting or serving any cheese that is particularly soft or full flavored to prevent flavor transfer from one cheese to another. 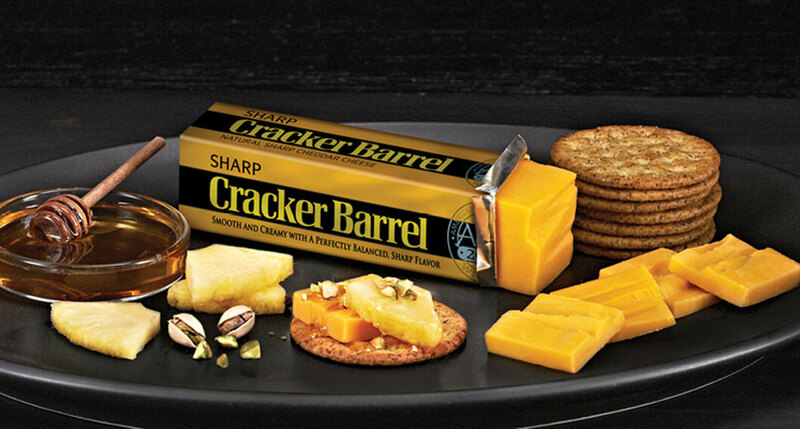 Cracker Barrel Extra Sharp Cheddar cuts through the luxurious sweet flavors of marcona almonds, roasted figs, fresh-cut apples, and golden honey with delicious results. Mark West Pinot Noir provides a perfect contrast to this pairing with its bright berry notes. To roast figs: Halve the figs and toss with a small amount of olive oil and honey. Roast in a 350 degree oven for 15-20 minutes, or until the figs soften and begin to caramelize. Marcona almonds are a variety of almond from Spain with a rich, complex flavor that is sweeter than conventional almonds. Dark chocolate is frequently listed by its Cacao content. If you prefer a sweeter dark chocolate, opt for lower cacao content, around 60 to 65%. If you prefer a more bitter dark chocolate, choose something with over 70% cacao. 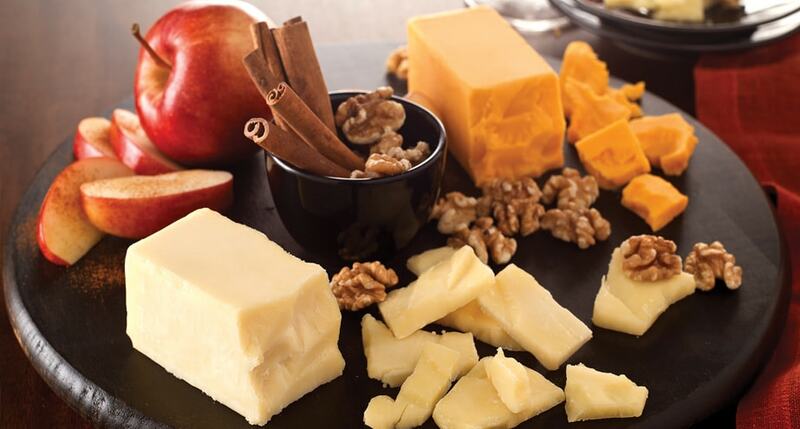 Take the traditional pairing of cheddar cheese and apples to another level with the addition of walnuts and cinnamon sugar. Dark red fruit flavors and an underlying earthiness in the Clos du Bois Cabernet Sauvignon provide another classic match to accompany this cheese pairing. Cut your apples immediately before serving to avoid serving browned apples. Avoid using lemon to minimize browning as the lemon flavor could negatively affect the flavors of the pairing. To make your own cinnamon sugar, combine 1/2 cup of granulated sugar with 1-1/2 tsp. ground cinnamon. 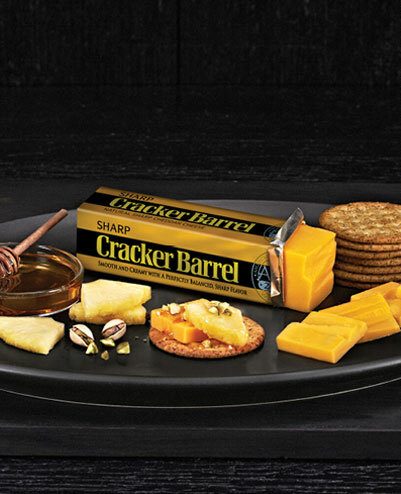 Honey and pistachio highlight the buttery nuttiness of Cracker Barrel’s Sharp Cheddar while pineapple provides a lively contrast that adds brightness to this unexpected combination. 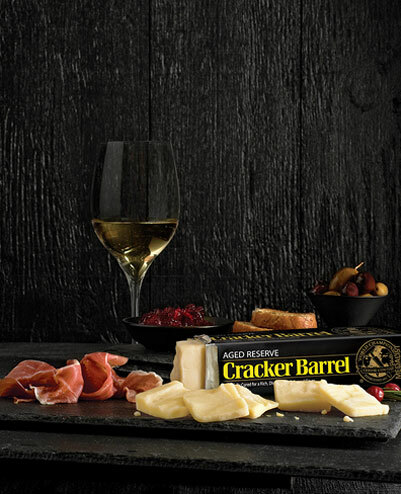 Woodbridge Chardonnay pairs perfectly with flavors of crème brulee and tree fruits. If your honey is crystallized, microwaving it briefly can restore it to its original state. Just make sure its packaging is microwave safe. 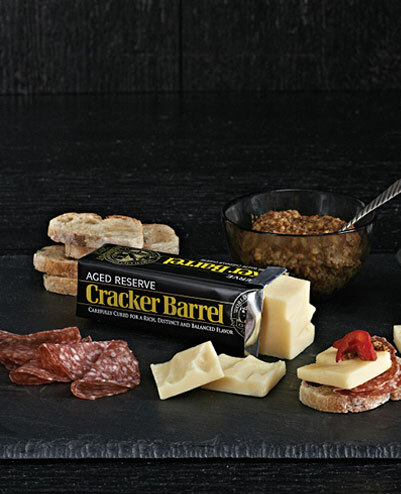 The complexity of Cracker Barrel’s Aged Reserve Cheddar pairs perfectly with rich cured salami and whole grain mustard, while the sweetness of roasted red peppers puts everything in harmony. Woodbridge Riesling rounds out this combination with delicate sweetness and palate cleansing acidity. 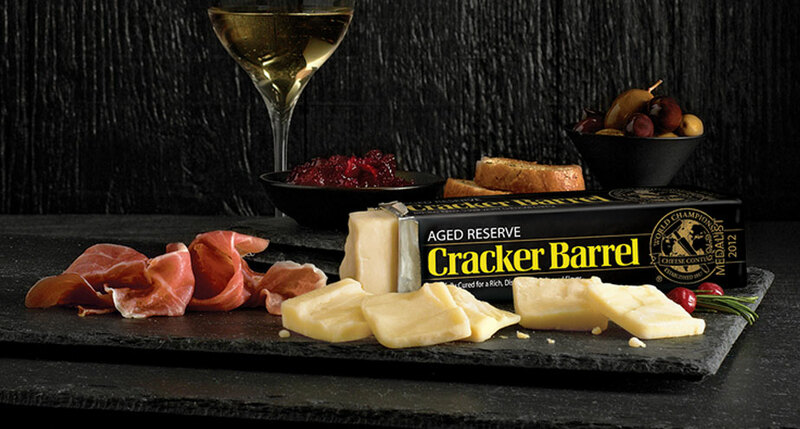 A decadent flavor combination for an award-winning cheese. Choose thinly-sliced artisanal salami for the best flavor. Roasted red peppers can be found jarred in most grocery stores. 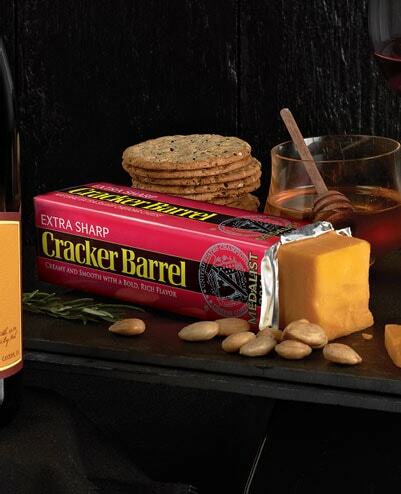 Perfect for the holidays, this mix of fruit and nuts pairs perfectly with the robust flavor of Aged Reserve Cheddar. 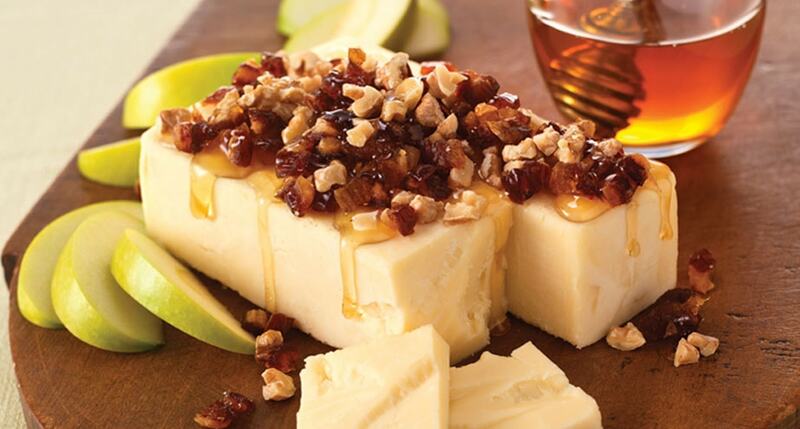 A drizzle of maple syrup and honey add a touch of sweetness, while chopped dates and cranberries round out the cheese board. 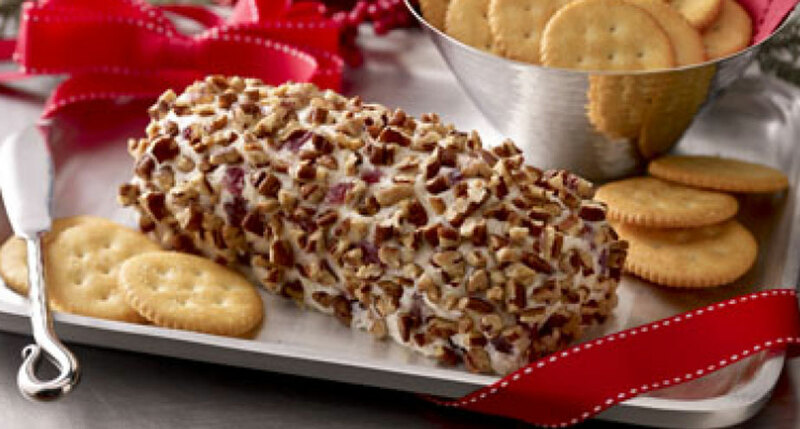 A simple delight for the holidays or any festive gathering. Cut your apples immediately before serving to avoid serving browned apples. Avoid using lemon as a way to minimize browning as the lemon flavor could negatively affect the flavors of the pairing. Strawberries and raisin bread, you ask? Indeed. 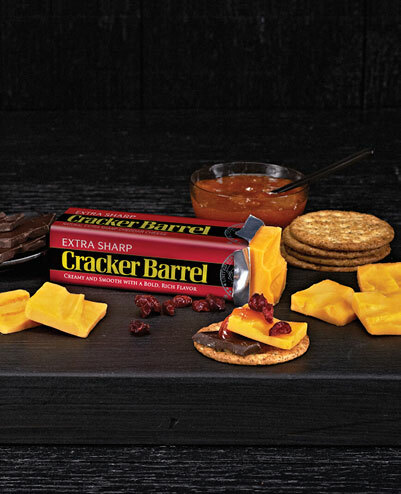 Sweet and fragrant raisin bread heightens the complexity of Cracker Barrel Aged Reserve Extra Sharp Cheddar while strawberries add a burst of freshness. The crisp finish and floral notes of Clos du Bois Pinot Grigio are heightened this exquisite pairing. For best flavor, let cheese stand at room temperature about 30 minutes before serving. 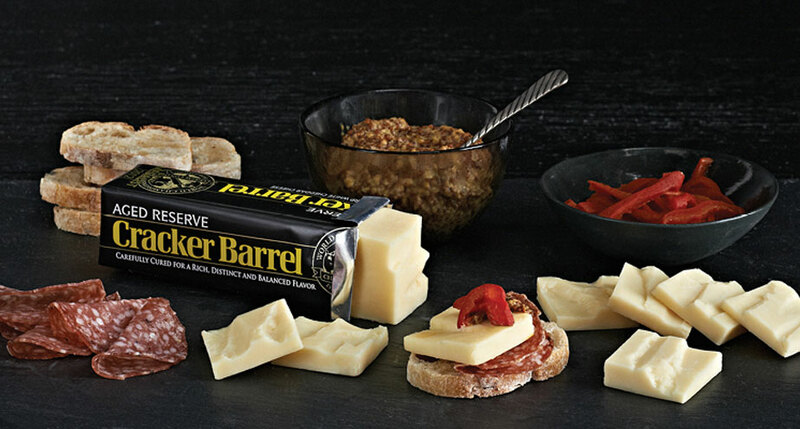 Mixed olives, garlic toast and prosciutto provide an exquisite savory match with the bold, sharp flavors of Cracker Barrel Aged Reserve Cheddar, while cranberry preserves lend a touch of sweet and sour to provide balance. Vanilla and melon notes in the Mark West Chardonnay offer another delicious layer of complexity to this luscious pairing. 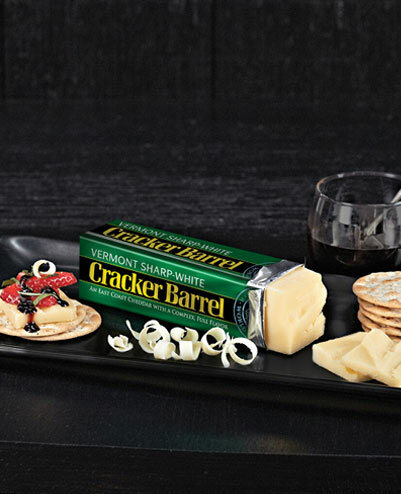 The classic flavor combination of strawberries, balsamic vinegar, and basil is heightened by Cracker Barrel Vermont White Cheddar. 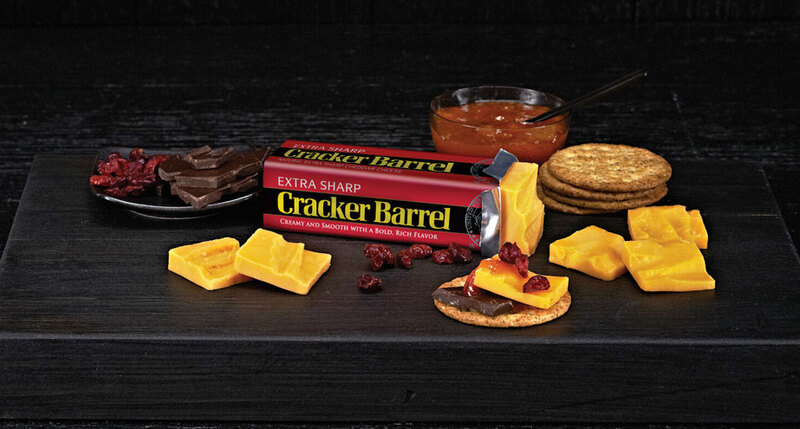 White chocolate adds a touch of sweetness to complement the berries while black pepper crackers brings a hint of spice to perfect this flavor combination. The light berry flavors and hint of orange zest in the Mark West Pinot Noir are an ideal complement. If you can’t find balsamic glaze at the store, you can make your own. Combine 1 cup of balsamic vinegar and 1/2 cup sugar. Bring the mixture to a boil over medium heat and let reduce by 1/3, or until it thickens slightly. Cool before serving, or store in the refrigerator for up to a month. Basil is best stored at room temperature in a glass of cool water, like a flower. Refrigeration can bruise the leaves and reduce storage life. 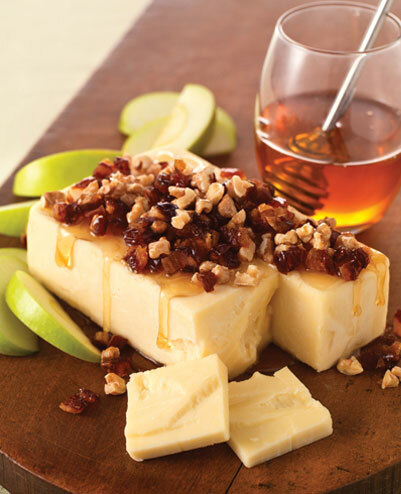 Take the traditional pairing of cheddar cheese and apples to another level with the addition of walnuts and cinnamon sugar. 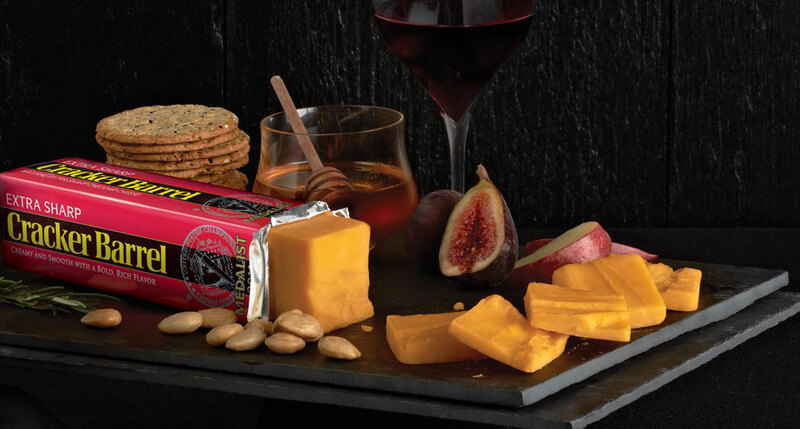 The dark red fruit flavors and underlying earthiness in the Clos du Bois Cabernet Sauvignon are classic matches to accompany this cheese pairing. Crunchy and sweet on the outside, smooth and delicious on the inside. Mix cream cheese and cheddar until blended, stir in cherries, and roll into a ball. Refrigerate at least two hours before rolling in nuts. Serve this crowd favorite with crackers. 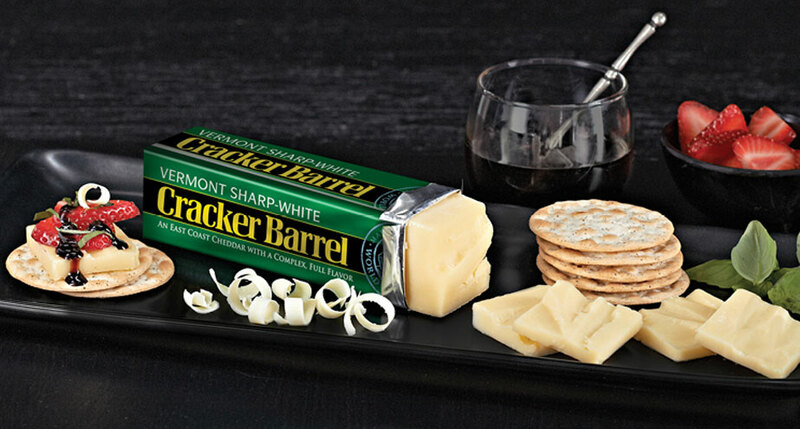 To wrap for gift giving, place cheese ball and knife on decorative platter or cutting board. Wrap with colorful cellophane and ribbon. 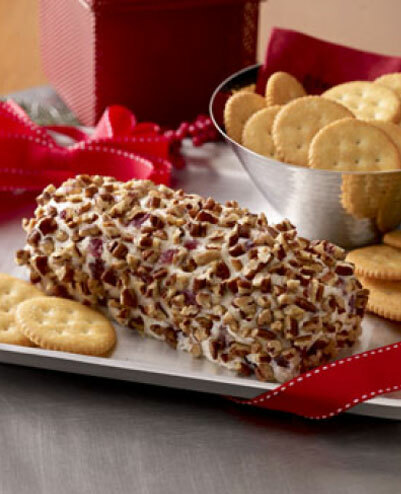 After serving the cheese ball at the holiday party, the hostess will have a lovely gift to remember the occasion!